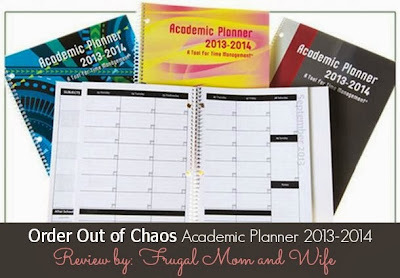 Frugal Mom and Wife: Order Out Of Chaos Academic Planner 2013-2014 Review! Order Out Of Chaos Academic Planner 2013-2014 Review! Order Out of Chaos was started when Leslie Josel's son was diagnosed with Attention Deficit Disorder and Executive Functioning Deficiencies. Uncovering ways to get and keep him organized at home and at school became her passion … and her business. Since that day, Order Out of Chaos has worked with students – both mainstream and with learning differences - to teach organization and time management skills. We believe that organizing is a life skill – and not just for school. Their goal is for each student to take age-appropriate responsibility for their schoolwork, time and activities while eliminating the stress and pressure that comes from being disorganized. Starting with the foundation that every child learns and thinks differently, and therefore organizes differently, we create systems that are unique to each student. That's where the Academic Planner came into play. My daughter has a busy schedule and so do I. She has Autism and along with it comes therapies, school, activities, Dr. appointments, and so much more. All those things can pile up very quickly and with so much to do chaos can happen at anytime. Organizing her time efficiently so everything is going with the flow is key. Last thing I want is to have to remember everything on my own, I need help. My daughter revolves around routines in which she works her best and even the smallest upset in that routine can bring havoc instantly. Though I cannot plan the unexpected I can keep up her progress levels, activities, and overall learning schedule efficiently with the Academic Planner by Order of Chaos. Each area in the planner gives me plenty of room to write what I need. I really love the functionality of this planner simply because it gives you using a planner tips in the beginning and it really opened my eyes on how to be even more organized. thank you so much for the awesome review. I am thrilled you have found it so useful. Please keep me posted on how the year goes and if you would like to run a giveaway for your readers I would be happy to share the twitter love!! Thank you for designing such a wonderful organizer. I will keep you updated as time goes by with the planner, I am so excited. I know my fans would love a giveaway! !